For the second time this season, Angel minor league starting pitcher Troy Scribner has been named his league’s pitcher of the week. The first time it occurred, he was pitching for the Angels’ Double-A Arkansas Travelers. He was named the Texas League Pitcher of the Week for tossing six shutout innings against the Frisco Rough Riders and gave up just three hits and one walk while striking out nine. 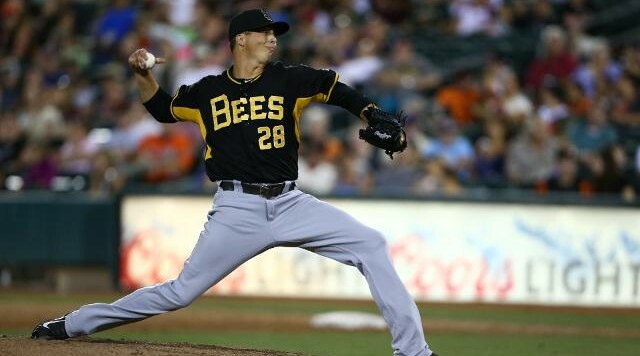 Scribner’s success in Double-A this year earned him a call up to the Angels’ Triple-A club, the Salt Lake Bees, and in his first ever game at this level, he pitched a complete game shutout against the Sacramento River Cats on July 30th. He allowed only two hits and two walks in his Triple-A debut, a performance that earned him the Pacific Coast League’s Pitcher of the Week honor. The six-foot-three Scribner just turned 25-years-old on July 2nd. He has a 3.14 ERA and a 1.08 WHIP in 17 starts this year. You can watch the final out of his 2-hit shutout here.